No visit to Peru is complete without visiting the “Lost City of the Incas” – Machu Picchu. 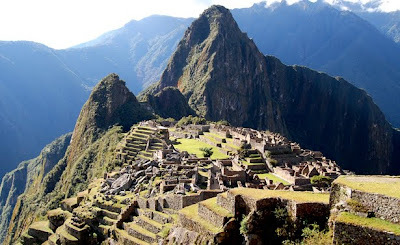 Most guidebooks place visiting Machu Picchu as a three to four day itinerary as part of the “Gringo Trail”. However, my friends and I made it in and out of Machu Picchu within 24 hours of arriving in Lima, with no advanced reservations whatsoever. Braving jet lag, and altitude sickness, here is a minute-by-minute breakdown of this crazy 24 hours, proving that such an endeavor can be achieved. 09:30pm Arrive in Lima, Peru. 10:00pm Eight of us pack into a taxi van into downtown Lima to spend the night at a friend’s apartment. 12:30pm After settling in and a quick dinner at a café, I get on the internet to purchase our LAN flight from Lima to Cusco, Peru. The first flight out is at 5:30am (US$194 one-way). We call to arrange for a taxi to take us back to the airport at 3:30am. 04:15am Departure hall at Lima airport is a chaotic mess. After finding the appropriate line for our LAN flight to Cusco, we get up to the counter, only to find out that our ticket and reservation bought just several hours ago did not go through. The friendly agent takes all our passports, a credit card, and starts entering our information for the next flight to Cusco at 6:20am. 06:20am Made it on board! The short 1-hour flight was uneventful. Still, they manage to serve a breakfast of muffins, chocolate bars and a beverage of choice. 07:45am After collecting our bags, we walk out onto the street in Cusco and haggle with taxi drivers for a ride to the Perurail ticket office. We had to split up into 2 taxis – cost about US$2 each taxi. 09:08am Another $2 taxi ride later, we are at the town square in Cusco. In all town squares all over Peru, you will find drivers waiting to fill up their vehicles with goods and/or passengers before they drive to the next town. 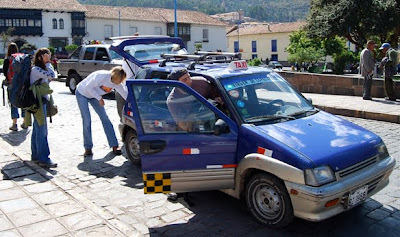 It is here that we hope to hitch a cheap ride to Ollantaytambo. We quickly find two cars going in the direction of Ollantaytambo. One was empty and the other had three passengers and a trunk full of onions. We split our group six and two. Katie and I hop into a car with three other Peruvians and a driver, the rest of our group cram into the other tiny sedan. Both cars speed off in opposite directions. Cost, about S/10 or US$3 per person. 10:03am After a short cramped ride travelling way too fast on an unpaved road, and speeding around blind corners with a 100 feet drop-off and no guardrails, our driver pulls over at a little village to unload two huge bags of onions from the trunk. Within minutes, we are off again. 10:51am Katie and I arrive at the train station in Ollantaytambo unscathed. Where is the other car? They couldn’t be behind us could they? 20 minutes later, the other car arrives, having taken a more leisurely pace and a quick stop for gas along the way. 11:10am We have exactly one hour before our train departs. As seasoned travelers, the eight of us swing into action, with half the group going off to find a place to stay for the night, and the other half seeking out a restaurant for a quick lunch. 11:30am My group finds a little restaurant serving sandwiches. We order eight. Almost at the same time, the other group arrives, having found an inn around the corner. We would get three private rooms, with a shared bathroom for S/15 or US$5 per person per night. Four of us grabbed two backpacks each and carried them to the inn for safekeeping. 11:43am Our food has yet to arrive. We have less than 30 minutes to make our train, cutting it real close! 11:46am Sandwiches are served. We grab what we can in our hands, and start walking towards the train station, eating along the way. 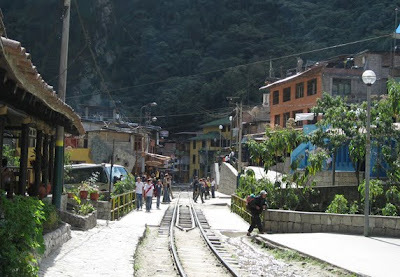 12:17pm We finally board the train for a one and a half hour ride to Aguas Calientes. 01:58pm Arriving at Aguas Calientes, you’re not quite at Machu Picchu yet. We walk across town to the Machu Picchu Cultural Center to get our entrance tickets to Machu Picchu itself (S/122 or US$45). Being a national park, Machu Picchu closes at 6pm each evening. We had less than 4 hours left. 02:20pm Almost there! We quickly head over to the pickup point to catch a bus up to Machu Picchu. Roundtrip cost: S/18 or US$6. 02:40pm This late in the day, there was hardly a wait or a line for the bus. We board the first bus, and were on our way winding up a narrow track with steep drop offs on one side. The 20 minute ride was punctuated with spectacular views of lush green mountains. 03:04pm There it is! Like a sculpture carved out of bare rock, Machu Picchu sits straddled between jagged peaks and lush foliage. The best part about arriving this late in the afternoon is that all the tourists have mostly left for the day. We practically had the entire park to ourselves, and free reign to all the spectacular vistas without having to jostle with other camera-wielding tourists. 3 hours at Machu Picchu was plenty of time to explore the entire ruins, and we even climbed up to the Watchman’s Hut for a spectacular aerial view of the area. 06:00pm Park closes, and we are ushered out to a line of waiting busses to take the last stragglers back down to Aguas Calientes. Having achieved our goal of seeing Machu Picchu, we spent the next few hours scouring the large craft market at Aguas Calientes for souvenirs. 07:40pm Everything about Aguas Calientes is catered to the tourists visiting Machu Picchu. We had dinner at an overpriced tourist restaurant where we had our first taste of Cuy (Guinea Pig) and Alpaca. 09:20pm Board the last backpacker train back to Ollantaytambo to spend the night. We were lucky on many accounts from getting a seat on the train at the last minute, to negotiating questionable taxi rides, and as such I will not recommend that anyone try to recreate this itinerary. 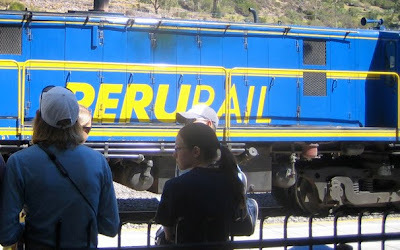 Not only do you run the risk of altitude sickness as you go from sea level in Lima to 11,600 feet in Cusco, but the trains to Aguas Calientes do sell out, sometimes days in advance during the peak travel months. However, if you are short on time, and Machu Picchu is a “must see” on your list, or just plan crazy like me, this is proof that Machu Picchu in 24 hours can be done! Note: As of this writing, all Perurail services to Aguas Calientes have been suspended indefinitely due to heavy rains and mudslides in Peru. This trip was made in July 2008 – Prices quoted may have changed.